Science and Technology plays a very important role in socio-economic development, education, eradication of poverty and illiteracy, achieving industrial progress – all with the prime objective of bringing improvement in quality of life. It has been found that, by addressing issues related to resources, knowledge, skill and technology, through various Science and Technology interventions at local level, this objective can be achieved. 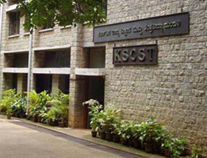 Karnataka State Council for Science and Technology (KSCST), a 34-year old autonomous organization, is working with this objective by taking science and technology to the rural population through various S&T inventions. Over last three decades, KSCST has translated a number of projects from research and demonstration phase to implementation and operational phase. 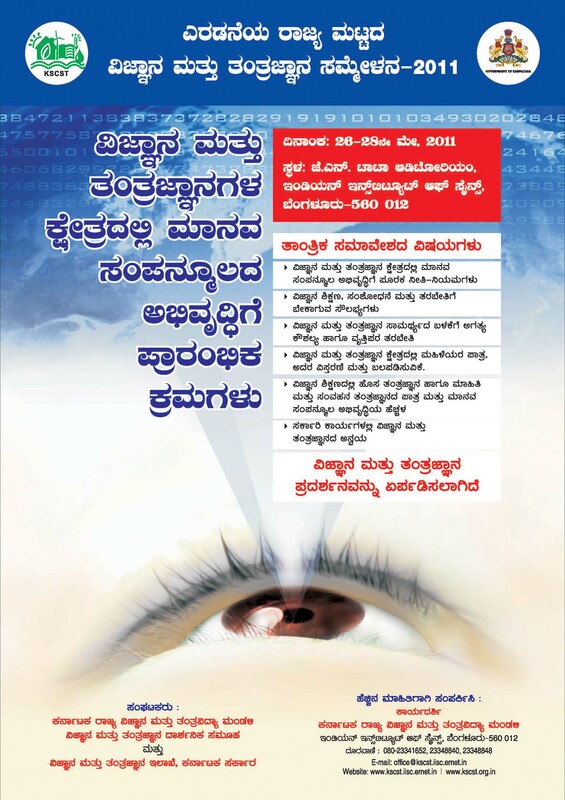 Vision Group on Science and Technology (VGST) is an advisory body of Department of Science and Technology (DST), Government of Karnataka, to recommend Science and Technology Programmes relevant to mandate of DST, with the objective of encouraging and promoting Science and Technology education and research in the state. VGST plays a vital role in strengthening educational institutions to meet the scientific and the technological needs. 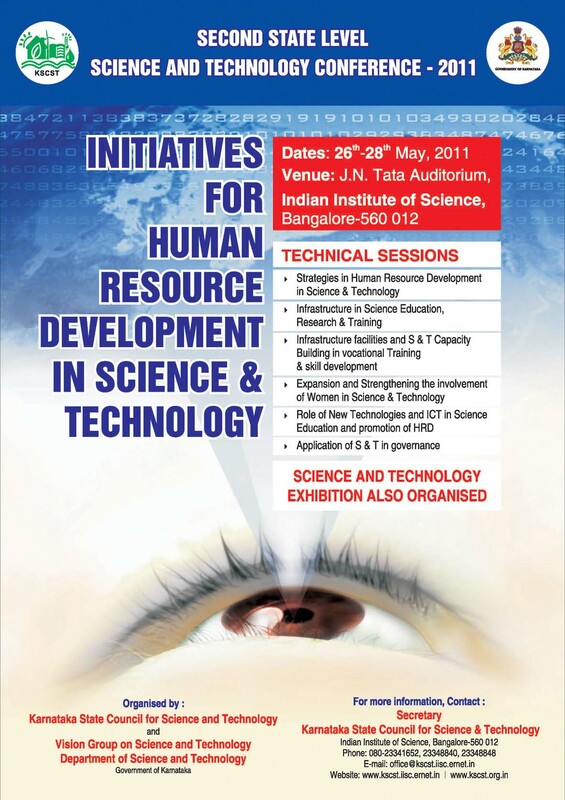 KSCST, VGST and DST, Government of Karnataka, are jointly organising a three-day Second State Level Science and Technology Conference on “INITIATIVES FOR HUMAN RESOURCE DEVELOPMENT IN SCIENCE & TECHNOLOGY” during 26th May 2011 to 28th May 2011 at J.N.Tata Auditorium, Indian Institute of Science, Bangalore. Last year, the Council, jointly with these partners, had organized First State Level Science and Technology Conference on theme "Science and Technology for Sustainable Development". To participate in this open forum discussion, planners, administrators, policy makers, faculty and students from various universities, NGOs, science promoters and others have been invited and about 500 participants are expected to participate. The conference will have three plenary sessions and seven technical sessions and a panel discussion, spread over three days. The technical sessions will include over 24 presentations by eminent scientists, senior administrators and experts. A Science and Technology Exhibition has also been organized. Prof. M. S. Mohan Kumar, Secretary, KSCST, is the Chief Coordinator and Dr. M. Prithviraj, Executive Secretary, KSCST, is the Coordinator of the conference. Dr. S. G. Sreekanteswara Swamy, Fellow, KSCST, is the Co-Coordinator of the Conference. The Inaugural Function is organized on 26th May 2011. Shri M. N. Vidyashankar, IAS, Principal Secretary, Department of Science and Technology, Government of Karnataka, will give introductory speech. Prof. C. N. R. Rao, FRS, Linus Pauling Research Professor, Advisor to the Prime Minister for Science and Technology, Honarary President, Jawaharlal Nehru Centre for Advanced Scientific Research, Bangalore, will be inaugurating the conference. Shri J. Krishna Palemar, Hon’ble Minister for Ecology and Environment, Fisheries, Science and Technology, Governmnt of Karnataka, will be the Guest of Honour. The function will be presided over by Prof. P. Balaram, Director, Indian Institute of Science, Bangalore. The Valedictory Function is organized on 28th May 2011. The valedictory address will be given by Prof. M. K. Surappa, Director, Indian Institute of Technology, Ropar (Punjab) and Prof. B. N. Raghunandan, Divisional Chairman, Earth and Environment Sciences, Indian Institute of Science, will be presiding over the function. It is felt that the Conference would serve its purpose of arriving at a consensus in formulating policies, planning meaningful programmes and activities so that suitable measures could be taken in Human Resources Development in Science and Technology in the state.